Our Guest Houses sleep 6. They have two bedrooms, two baths and a loft. One bedroom has a queen and the loft and other bedroom have twin beds. Our rates are $85per person, per night, for the first 2 occupants. Each additional occupant @ $85 per night for adults and $75 for children age 10 and under. 4 RV Hook ups available - $50 a night for 2 people. Additional people are $10 each, per night. when there is a 2 night minimum stay. $135 per person per night. There is a 2 night minimum stay requirement. Adults only. 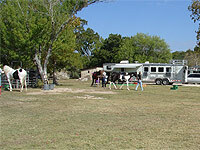 Rates include unlimited riding, access to all training facilities, horse pen, and other activities on the ranch. Pens for horses are near the Guest Houses. Beer and wine are available. Sorry, no pets allowed. 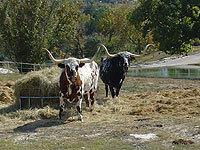 Rates Include water, electricity, rocked in Bar-B-Q pits, 2 covered horse pens and unlimited riding. Trailers must be black and grey water self-contained. Please no tent camping. Bring your horse for the day and enjoy over 18 miles of trail-riding and the use of our arena, round pen and wash racks. 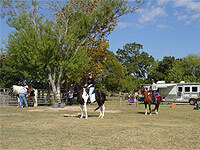 For an additional $10 per person you and your horse can utilize our obstacle course before you hit the trails. Practice for a bit, enjoy a leisurely trail ride and then practice again. There will be a $50 per person, early departure fee to cover the cost of pre-paid catering for guesthouse visitors. SCR will provide a "Rain Check" for cancellations if you contact us prior to 10 days before your reservation however we can not refund deposits. If the cancellation occurs within 10 days of the reservation no "Rain Check" is available.